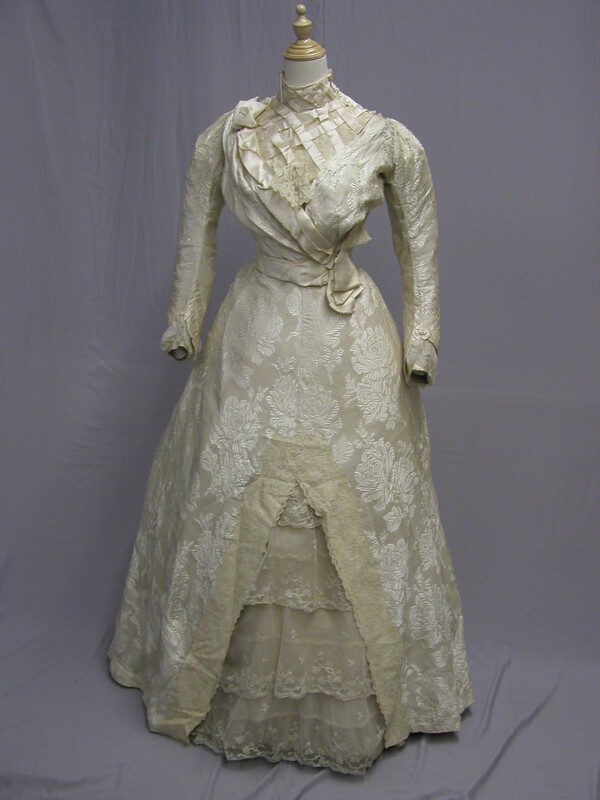 DR482, 1890’s Frederick Worth French Brocade Tea Gown: This absolutely stunning dress was designed by Charles Frederick Worth in the 1890's. 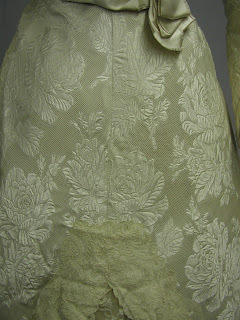 It is made of a luscious french silk brocade that is a deep ivory color with large cabbage roses as its motif. The fabric is one of the softest fabrics that I have ever felt. I purchased this gown from eBay the first year they were in business. The hand woven petersham reads Paris - Worth - Paris. While the Worth is in dark threads the Paris letters are woven in cream threads so they are harder to photograph. They are on either side of the word Worth. The skirt is in good condition. It has a waist of 23 and it is 42 inches long. There is minor wear in places and a few age related spots. There were originally six chiffon ruffles under the front lace at the hem. There are only four of those ruffles left. 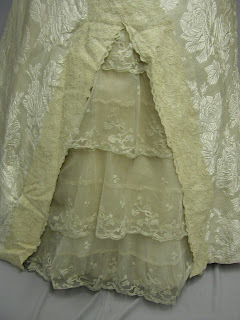 The dress has a built in gold slip which has a 3 inch tear in the back about 1/4 of the way down. It needs to be stabilized. The bodice has many more issues. It has a waist of 22 and a bust of 31. 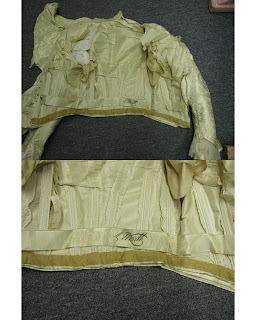 The lining which you don't see when the bodice is on a dress form is shattering. See photos. There is a hole on the left shoulder the size of a quarter that needs to be stabilized and a wear space just under that on the front of the bodice. The left arm has underarm stains and has one hole near the underarm seam. The right arm has one small hole near the back seam and has a small wear through spot under that. It has one small hole close to the underarm seam in front. These are not very noticeable when it is on a dress form. 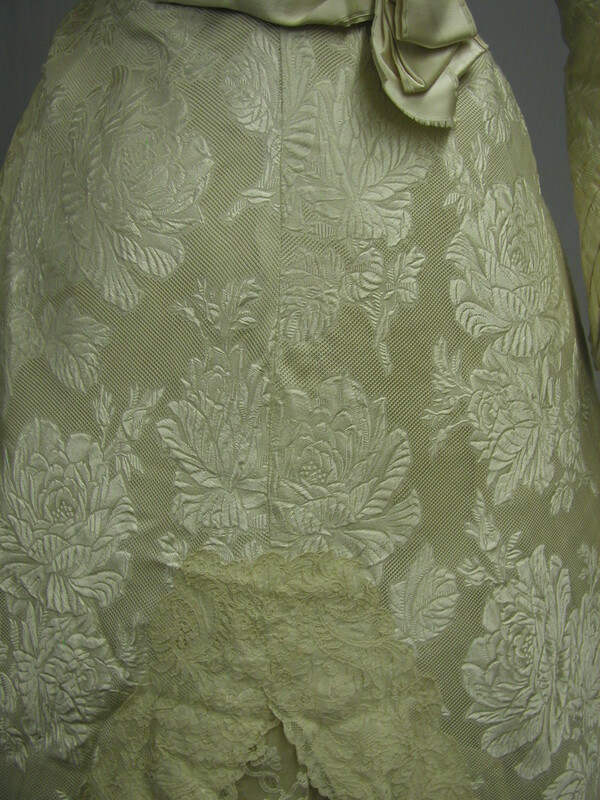 The lining at the top shoulder where it closes is entirely shattered and this will need stabilizing. There are no eyes left, but the original hooks are there. 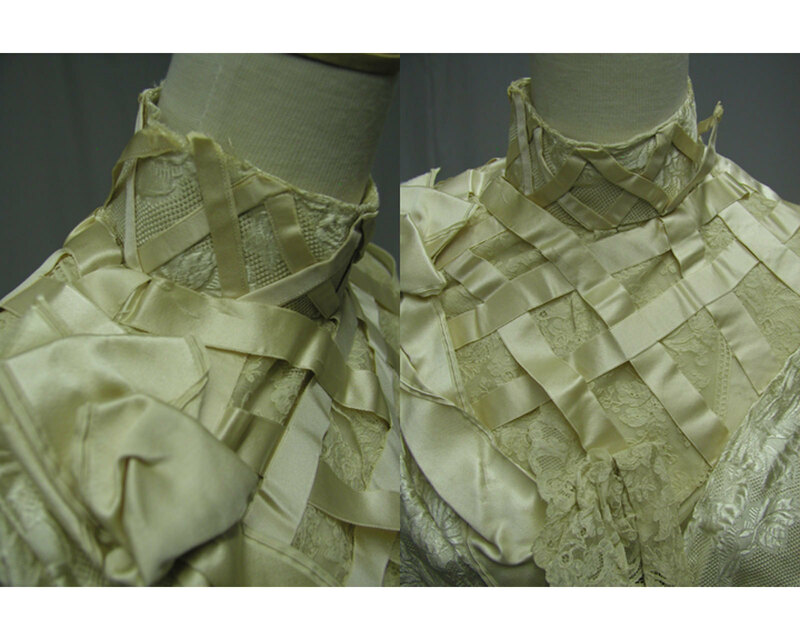 The crisscross satin ribbon at the neckline is worn on the edges and two of them are loose and need a few stitches to hold them back in place. The right arm sleeve lining is shattered. This would take a good seamstress to stabilize this bodice, but it is well worth the time. 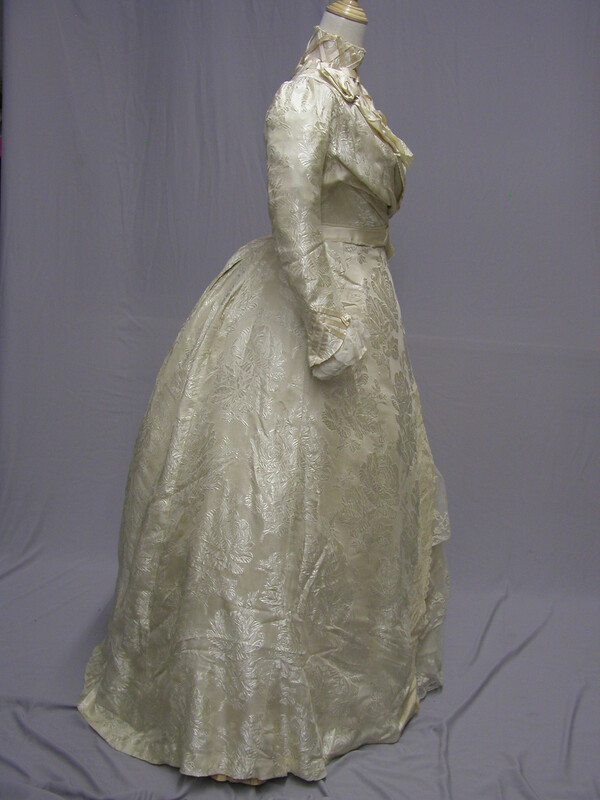 The outer part of the garment doesn't show that much wear when it is on a dress form. It displays very well as you can see from the photographs. The bidding will start at .99. 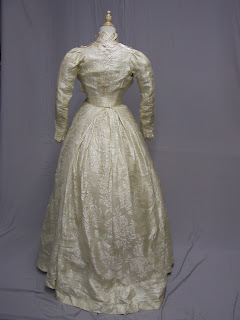 I'd date it to the late 1880s from the bustle. 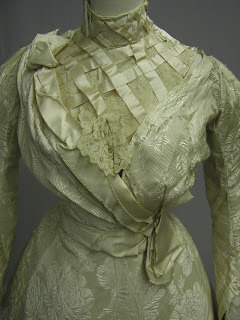 But I agree that the waist and neckline styling, if not the sleeves, look early 1900s. Very strange. Still, look at the side view; I don't see how there'd be a bustle like that in the early 1900s (or 1890s.) 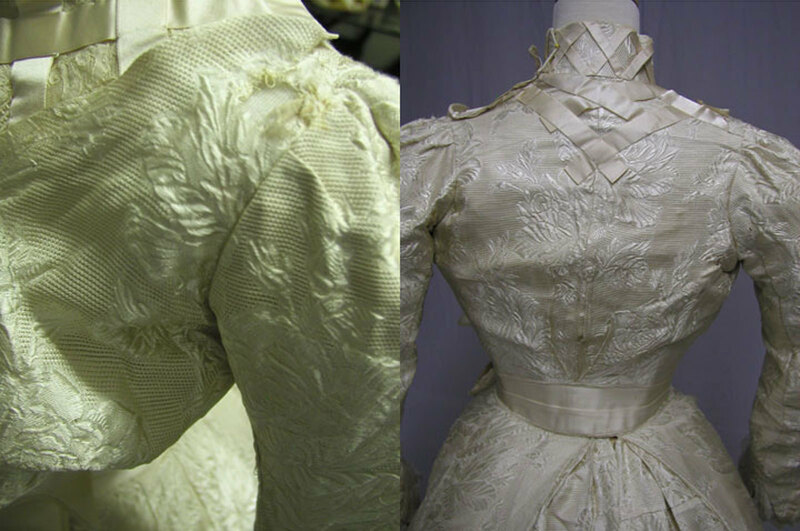 And that would explain the front opening and heavy brocade, which seems very 1880s. 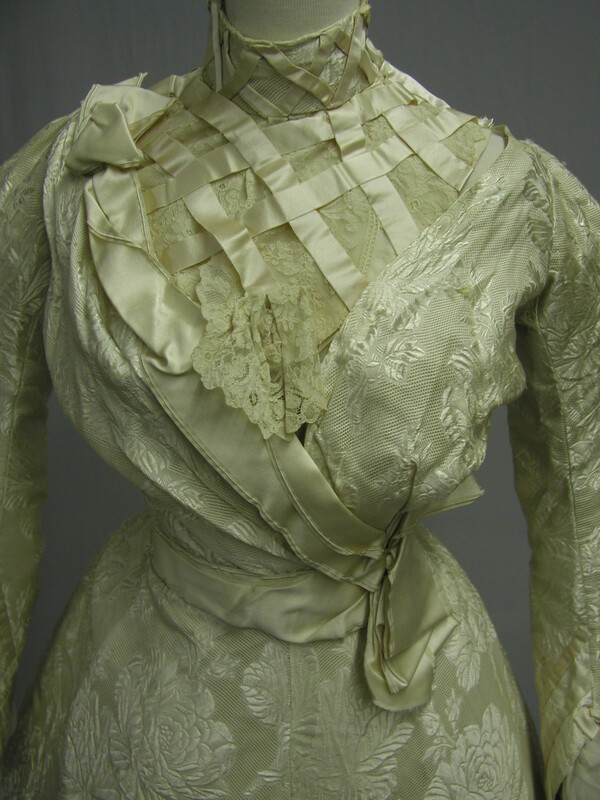 I'm wondering if a little research would turn up similar bodices in the late 1880s ... perhaps with Aesthetic Dress influence. I haven't done it, but that'd be my guess. There isn't a bustle. What you see in the first picture is actually the seller poofing out the skirt incorrectly because the dress is on an incorrect dress form. I talk about the s-curve corset in other posts where it forced the bum out - just as it would with this dress, hence the extra material in the back. 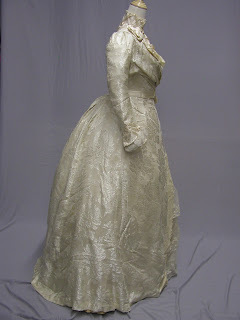 But it's not a bustle, it's just a poor display. Yeah, I wondered about that later -- whether the seller just put it on the mannequin wrong to create that shape. The s-curve would bring the behind up, but it shouldn't look as rounded as that. Of course, a seller can just arrange the material for the photo wherever they feel, I guess! 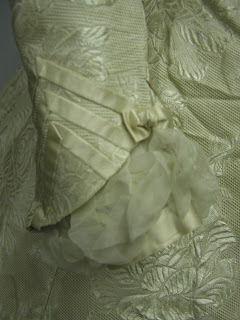 look where the material is the furthest out - it's not where you would typically see with a bustle era dress. This dress has the most material "going back" near the mid thigh, not the bum area. You can tell the material is being forced to do that too.